In a recent article by Global Arbitration Review, the second editionof a recent empirical study reveals that the cost of investment arbitration is unfortunately on the rise yet again. Since 2013, average party costs were a massive USD 7.41 million for claimants and USD 5.19 million for respondents. Before then, costs averaged USD 4.43 million for claimants and USD 4.6 million for respondents. This represents an increase of 68% and 13%, respectively. Although these figures are affected by large claims such as the Yukos case, there has nevertheless been a significant increase in cost. According to the latest data, claimants will generally incur greater party costs. The reasons for this may be attributable to the claimant’s burden of proof and the concern of respondent-States to focus on a more cost-driven approach. It is possible to reduce party costs significantly for both Claimants and States. Nevertheless, primarily due to the cost of investor-State arbitral tribunals, the minimum cost of an investment arbitration is likely to be USD 1.3 million or more, as set forth below. Part of the reason why the cost of investment arbitration is more today is the increase of fees of the arbitral tribunal. At the end of 2012, tribunal costs averaged USD 746,000. Today, that number has risen nearly 50% to a significant USD 1.19 million, meaning that both parties would be expected to bear USD 595,000 in costs for the arbitral tribunal alone. Interestingly, average tribunal costs between ICSID and UNCITRAL proceedings have grown in difference since 2013. Median rates, however, appear to remain the same. Pre-2013, average tribunal costs were USD 769,000 and USD 853,000 for ICSID and UNCITRAL cases, respectively. Since then, average ICSID tribunal costs are now USD 1.04 million whereas UNCITRAL tribunal costs are at USD 1.38 million. The disparity increased despite the fact that the ICSID has retained the same USD 3,000 daily fee cap since 1 January 2008 and changes to the 2010 UNCITRAL Rules addressed the issue of unreasonable tribunal fees. While the cost of arbitral tribunals cannot be easily reduced, since this is outside of the parties’ control, it is possible to dramatically reduce the overall cost of investment arbitration, primarily by reducing legal fees. For previous clients involved in investment arbitrations, for instance, Aceris Law caps its legal fees at cost, meaning that no profits will be earned by the firm unless the case is a success for its client. Even for a bare-bones ICSID claim, however, the minimum cost is likely to still be at least GBP 989,216 (i.e., approximately USD 1.3 million). The table below shows the minimum likely cost of an investment arbitration, assuming relatively cost-effective expert fees, competitive legal fees and a relatively efficient arbitral tribunal. 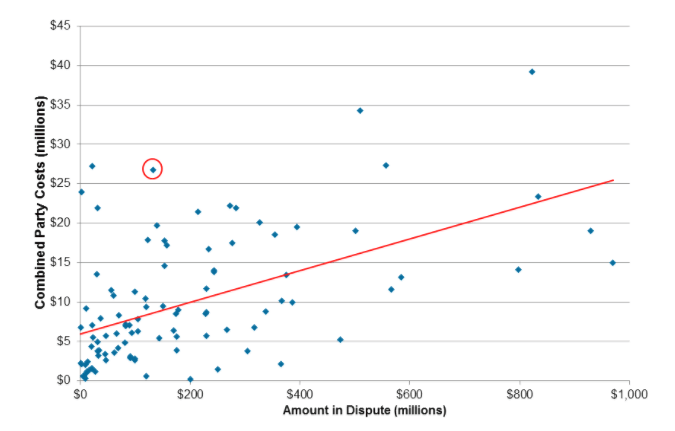 The minimum cost of investor-State arbitration of approximately USD 1.3 million also has implications with respect to the third-party funding of investor-State disputes. In general, third-party funders tend to only be willing to consider the funding of cases where minimum returns of ten times the amount of funding to be provided is possible. For investor-State arbitrations, funders tend to consider minimum returns as the amount that was actually invested, since restitution these amounts is less speculative than claims for lost profits and a primary measure of reparation in investor-State arbitrations. As the minimum cost of investor-State arbitration is for all practical purposes USD 1.3 million, and the actual amounts invested are generally considered by funders as minimum returns, this means that cases where less than USD 13 million were invested are highly unlikely to be funded by third-party funders. Thus, claimants who have invested less than USD 13 million in a foreign State are unlikely to have their investor-State arbitration funded. If they cannot pay the minimum cost of approximately USD 1.3 million to bring such a dispute, they may simply never have their day in court. Damages: Does the Cost of Investment Arbitration Warrant the Returns? Since the end of 2012, the average amount claimed in investment arbitrations has risen to USD 2.38 billion from USD 491.7 million. Even after excluding large outlier cases such as Yukos, the average is still USD 1.13 billion. Interestingly, despite the increase in claimed amounts, case proceedings themselves have only risen by a modest six months. Pre-2103, an average case lasted 3.7 years. Today, however, that number is now 4.3 years. So what accounts for the higher cost in investment arbitration? Figure 1 above reveals a correlation between party costs (combined) and the amount in controversy. In other words, the larger the claim, the higher the parties’ legal costs will typically be. While this may be unsurprising, it reflects the principle that parties will generally be prepared to spend more when the stakes are higher. Some cases will remain outliers, however, primarily due to legal costs, which can vary significantly. While Respondent States prevailed in 55% of cases, the mean amount awarded was USD 1.08 billion (considering the USD 50 billion Yukos award) or USD 171 million (not considering the USD 50 billion Yukos award). Thus, while the amounts awarded were far smaller than the initial amounts claimed, by a factor of over ten, bringing an investment arbitration was indeed worth it for those parties who could afford the significant cost of investment arbitration. This study reviews investment treaty arbitrations taking place since the end of 2012. The first edition can be found here. The claimants’ party costs in that case were USD 81.4 million, and the respondent’s costs amounted to USD 31.5 million. Costs in that case were USD 26.7 million in a claim totaling USD 132.5 million, which are both well above and well below the mean numbers, respectively. The reason for this may relate to the complex facts of the case (which involved allegations of corruption) as well as a request for provisional measures that was a drawn-out disclosure process.